Event Party Planners Los Angeles CA. Lookalikes, Murder Mystery Dinner, Stilt Walkers, Magicians, Jugglers, Cirque Acts, Picnic Games, Game Shows - Since 1985. We Make Your Event Planning Simple! Murder Mystery dinner shows, Celebrity Roasts for Birthday parties and retirement parties. Circus Acts with aerial cirque performers perform during our Casino Parties bringing the excitement of Las Vegas to your event. Game Shows make great Team Building Workshops and Team Building Activities which can be brought outdoors for Picnic Games and corporate activities. Comedians, Magicians, Celebrity Look Alike, Impersonators, Tarot Readers and Caricature Artists mix and mingle during your cocktail reception while our LA cover bands and musicians create the perfect party atmosphere. Team Building Scavenger hunts in Los Angeles, Hollywood, San Diego, Santa Barbara and Las Vegas Nevada allow a corporate team bonding actvity bringing your conference together viiting the local sights while interacting with your team mates. "The Witch's Brew" - scavenger hunt and seance. Guests receive a list of scavenger hunt items to collect. The items are mixed into the cauldron to create the Witch’s Brew. One drink sends the cast into a mystical séance, bringing back a spirit from the other side. Interactive entertainment includes: Tarot Card readings close up magic, and handwriting analysis. It seems like any other party until, POW, WHAM, CRASH, somebody dies. Every guest is a suspect including you! Can you solve the mystery & win a prize? Detective Riley leaves everyone dying with laughter as he exposes information about your company & guests. Also designed as a teambuilding event. Join in the madcap antics that occur when the Italian Fettuccini Family meets the bride’s dysfunctional Beverly Hills family for the first time. Dance the Tarantella, catch the garter or sit back and enjoy this hysterical interactive adventure. It’s a mock wedding and ceremony you'll never forget! Let the Godfather pay his respect to your employee of the month. Have Jack Nicholson share a few of his secrets about your Managers. Join in the fun as Paul Lynde leads you through a game of Hollywood Squares where all questions revolve around your guests! A very personalized one-of-a-kind event. It’s sure to be no ordinary wedding for Frankie & Mia. Join in the madcap antics that occur when the very Italian “Fettuccini Family” meets the upper crust and quite dysfunctional “Beverly Hills Family” for the very first time. Guests are invited to join in as members of the family and friends during a wedding ceremony filled with laughter and surprises. The hilarious event continues with a reception you’ll never forget! “If you saw Tony & Tina’s Wedding you’ll love Frankie & Mia”. Pay your respects to Frankie, the groom, as he says, “Goodbye to all the girls he’s loved before”. Have you met the bride Mia? Rumor has it, she’s already married! It’s no rumor that her mother, Mrs. Upjohn, has had a few too many Martinis. Look out young Bachelors, she’s on to husband number five. Meet Frankie’s Cousin Carlena, as she introduces you to her new line of edible lingerie. Watch out for Cousin Vinnie, he always takes his work to Church. The Ceremony will be performed by the righteous Reverend Dr. J.J. Richman, Chaplain in the United States Army. Be prepared to drop and give him five! This hilarious adventure continues with a wedding reception you’ll never forget. Dance the Tarantella, catch the garter, or sit back and enjoy this interactive wedding farce. Be completely entertained with a blend of dance, gymnastic, flying objects, and flying humans! Tumbling, bungee gymnastics, flaming torches, acrobats, aerialist, trapeze, stilt walker, cube, contortionist, clowns - Breathtaking! Amazing animal actors also available. As seen on the Tonight Show with Jay Leno. Ferris Wheel, Bumper Cars, Giant Slides, Velcro Wall, Moon Bounce, carnival skill games, and several food booths. Stages are set up where professional performers put on variety shows. Live bands keep the party going with a variety of family music. We'll provide you with all the classic casino games found in a Las Vegas casino. Our dealers are professional, courteous and fun. And why stop there? Pull out all the stops and add a variety act. We offer several musical showroom reviews. We can even provide strolling showgirls or celebrity impersonators for a truly spectacular event! Black Jack, Roulette, Craps, Live Music... It's guaranteed to be a hit! Ahhhhh, Dial M - we make your dreams come true! All parties, all locations. Even for our troops in all countries! Put together the fun elements of The Weakest Link, Family Feud, & Jeopardy, and you’ll find yourself caught in a game show that will have everyone eager to answer questions to win their team a “link”. Our hosts are brilliantly funny & deliver the game in an atmosphere of friendly competition. We can create a round of questions based on your group. Write your own songs! An engaging process in which employees write their own songs in any style that will suite your group; blues, beach theme, country, pop... They can write songs with a message, such as: "what's going on in the organization" or "how to work as a team". They can also write songs with no specific goal other than bonding and presenting the material as a team. Backed by our professional musicians, employees take turns rehearsing with the band before they present their freshly penned songs to the group. Our facilitators are quite skillful at getting even the most reserved to add a line or sing a word. And, there's always enough hams out there to sing the humorous selections of your "Corporate-INXS Workshop". 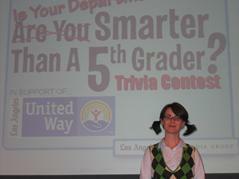 "IS YOUR DEPARTMENT SMARTER THAN A 5TH GRADER?" Similar to the popular T.V. show. This show is played in teams where the competition will be eliminated down to one final winning team. Our hosts keep the show organized, comedic, and fast paced, while our improv/comedy actors play the roles of the 5th graders. Company questions and bonus questions are included. We encourage the participants and the viewing audience to interact and vote for their favorite team. A Casino event played as a team building event. We start off the event with a practice session with the dealers teaching everyone how to play the various games. We'll break for a meal and hand out packets containing $10,000 to each table who will be designated as a team. Each team will come up with their own strategy to try to win the most money. At a designated time the team with the most money wins! Imagine the thrill and enjoyment you and your guests will receive with the exciting, fast-paced action of your own Casino. Blackjack tables, Roulette Tables, Poker Tables, Craps Tables, Texas Hold Em Tables, Wheel of Fortune, Professional Casino Dealers. Highly original magic happens with sleeves rolled up, right before your eyes, often right in your hands. This is a magical journey that includes rings, ropes, predictions, cards, money, and mind-reading with loads of comedy and fun! This audience-participation show is tailored to each event. Singer/comedienne, Miss Peggy has gone on to headline her own one-woman show, with knockout performances that capture the highs and lows of a wannabe showbiz legend. She’s the glistening blonde 60’s starlet who parlayed a dead-end career in Elvis movies into a knockout Vegas success story, only to find herself crashing and burning in the fastlane. We offer six interactive team building events to choose from. Our motivational workshops are versatile enough to inspire new teams, while boosting the morale of existing ones. Build management skills, develop team working, and learn communication and listening skills, while renewing company spirit. Will “The Donald” and his side kicks George and Carolyn decide that your team has what it takes to climb the corporate ladder? Relive the challenges created on “The Apprentice” T.V. Show, with this inspiring, interactive team building game where you’re not fired, but hired! Your goal is to navigate your way through business objectives to gain the ultimate power position - early retirement at full pay! For all ages and abilities. Our Coaches & Cheerleaders will attend your company picnic and lead your teams through fun interactive sports games, where no running or rope courses are involved. We have a very wide variety of creative games that will make you laugh as you engage in friendly competition. Imagine an entertainer who can read your mind, analyze your handwriting, and duplicate an image locked in your head, all while eliciting laughs along with the gasps. Award winning mentalist Josh will also cause silverware to twist and bend with the power of his mind and help your audience to focus their thoughts on an object until it moves from across the room! This is a show your guests will be talking about for years to come. Must be experienced to be believed. Picnic games are fun for corporate team building, fundraisers and any family event. Let our "Coaches and Cheerleaders" lead your participants through a fun day of bonding picnic games. We supply all the materials, music, props and team leaders. Interactive games and teambuilding events. Our motivational workshops are versatile enough to inspire new teams, while boosting the morale of existing ones. Build management skills, develop team working, and learn communication and listening skills, while renewing company spirit. Also: Picnic games with party motivators. A smashingly shagadelic 60’s groovy dance party, Yeah Baby! This band is Fab man. A mock “British Invasion” band with real Go-Go dancers. Songs from The Who, The Kinks, The Rolling Stones, The Monkees, The Doors, The Ventures, The Beach Boys, The Animals, The Yardbirds... If they were any cooler they’d be frozen! Your next “bored” meeting doesn’t need to be. John will morph into a myriad of public figures. Weave your important messages into humorous presentations. Imagine David Letterman announcing the Top 10 ways you know you're in merger! When Larry King interviews your C.E.O., your audience will love it! "An Evening With The Hollywood Stars" - A live musical celebrity impersonators variety show. We belong to Copyscape and will be notified if pictures or content is copies without our permission.